The Britain of the Roman Occupation is little known to us. Archaeology has turned up the remnants of cities and villages, with their monuments and temples, tools and vases, and all the small bits and bobs that their inhabitants daily used. But, when skilfully and arduously put together, they provide only fragmented insights into a long gone era and reveal only the smallest glimpses, the briefest moments, into the lives of individuals. It’s these glimpses that Guy De La Bedoyere has painstakingly researched in every document, artefact, and traces left by the inhabitants of Roman Britain. He’s not interested in the kings and queens (they take a backseat here), but in the soldiers, workers, slaves, fathers, wives, daughters, children, lovers, and all the common people who lived at the time. Its’ their personal stories, or better, the tiny fragments of them that have survived to our time, that make history (and this book) come alive. Most of these people were Roman immigrants (natives never seemed to be able to climb up the social ladder, although some may have, and we simply have no record of them). They did business, looked for spiritual comfort in an uncertain and cruel world, grieved for their lost children, fought battles, hid their possessions underground, married their slaves, and scrambled for power. Because we have so little information about each individual, De La Bedoyere tends to jump from one to another really quickly. This, paired with the sometimes dry nature of the text, doesn’t always make for easy reading. Despite this, I happily carried on. De La Bedoyere may not be the most engaging writer, but he manages to paint quite a vivid and colourful picture of life in Roman Britain. If you are tired of reading always about kings and queens, the battles they fought and the lands they conquered, and would like to know more about the usually forgotten common people and how they lived, I recommend you pick up this book. You’ll enjoy it. 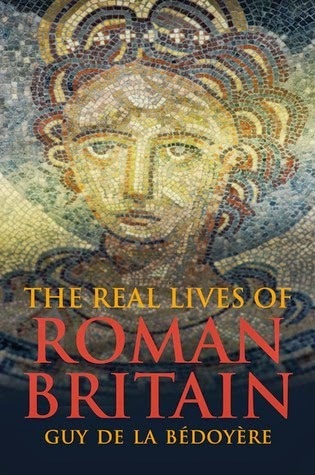 Although the execution leaves something to be desired, The Lives Of Roman Britain paints a vivid picture of the life of the real people – the workers, slaves, husband, wives, and children – that inhabited that long gone era.